The Koh Chang Marine National Park, comprising of 52 islands, is well preserved by nature. Rich in rainforests, well-laden with colourful corals, abundantly stocked with healthy marine lives and encompassed by spectacular coastlines, the archipelago offers a great way to island hop. The islands have gorgeous landscapes, pristine beaches and crystal clear sea. However, only 10 of these islands have accommodation, which range from the very basic thatched roof huts of 10 USD a night to the more luxurious and sophisticated properties that can cost as much as 500 USD a night. There are some island resorts that only accept package tours of full board groups because of their exclusivity and distance from the mainland. The packages include boat transfers, full meals, usually at least 2 nights accommodation. Some of the packages include side trips to other islands. Most of the islands have limited or no development at all and many are uninhabited. Next to Koh Chang, the most popular of these islands are Koh Kood and Koh Mak. The southern side of Koh Chang Noi is a pretty good snorkeling spot. The unspoilt coral reef lies in the sea bed between the island Laem Chang Noi (Chang Noi Cape). If you are somewhere on Klong Prao or Kai Bae Beach, then this group of islands is delightfully visible and at times, reachable by kayak. The best snorkeling spot among the three is at Koh Yuak’s shallow water with a small beachfront of sand formed from decayed corals. Nearby are Koh Plee and Koh Suwan. And around Koh Suwan is Koh Rom with colorful corals about 6 meters deep. Down south is Koh Man Nai which is reachable from Sea View Resort during low tide when the island exposes its sandy beach. The twin island to Koh Man Nai, Koh Man Nok is linked by shallow waters and gold-colored seaweed. Koh Khlum has a historical significance as the battleground between the French and the Thai navies during the French colonization of Indochina. It was also a shelter for the Thai naval forces. Koh Khlum is an excellent dive site especially at Larn Hin area. You can explore coral reefs at Hin Look Bard and Hin Larp which are about 10-20 metres deep. It is also a great fishing spot with an abundance of big fishes. This is a small island situated within Ao Salak Petch (Salak Petch Bay). Originally it was known as Koh Phrao because of the long lines of coconut trees on the island. Today, it is more commonly called Koh Sai Khao to reflect the abundance of fine white sand on the island. So abundant is the sand that a sand dune now extends to the sea and is particularly obvious during the low tide. Koh Sai Khao has a scenic view, clean clear seawater and is very serene. A concrete pavement by the seaside allows a pleasant stroll. One side of the island has a concrete bridge, which stretches out into the sea and serves as a pier and a great view point. Situated further south of Koh Sai Khao is a group of 3 small islands called Koh Laoya Nai, Koh Laoya Klang and Koh Laoya Nok. They are famous for their long white sandy beaches, sparkling clear seawaters, green forests and an amazingly beautiful coral settlement beneath the shallow seawater, particularly at Laoya Klang. A wooden bridge links the islands of Koh Laoya Klang to Koh Laoya Nai. Here, you will find the water beneath the bridge very clear. Koh Wai is a bigger island further south of Koh Laoya with huge bays. The beaches of Koh Wai is beautiful with reddish clean sand, some of which has corals right from the beach, especially the lump corals which are found to be large and in their best conditions. The northern beach is the most popular due to its long sandy beachfront and healthy corals. Seawater are relatively shallow and snorkeling is a favourite activity as Koh Wai is blessed with a coral reef of up to 2 kms long. Encircling the island are many rocks making it a perfect fishing ground with a great quantity and variety of fishes. 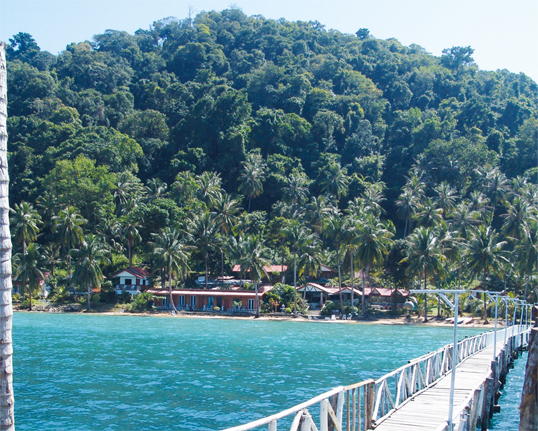 Koh Ngam is an enchanting island just a few hundred meters off the southern coast of Koh Chang. It is a small island with a very narrow sand dune that forms a gorgeous contour holding the northeast and southwest section of the island together. The almost kidney-shaped island would look like 2 separate islands from afar. Besides holding the island in one piece, the sand dune created 2 crescent-shaped lagoons which are only 50 meters apart. Corals and fishes are aplenty. Occasionally, you may see dolphins in the area. For the more adventurous, a hike up the rocks to a 100 meter-tall hill on the southwest side of the island is both challenging and rewarding. Ropes are provided to guide you. Over the hill is a white sand beach where you will also see plenty of decayed corals and serves as an excellent viewpoint for the islands of Koh Wai, Koh Mak, Koh Laoya, Koh Kradad and Koh Chang. Fresh-water ponds are found on the island. A waterfall flows across the island during the rainy season. This is a group of islands southeast of Koh Chang with unspoilt nature most suitable for swimming and fishing. The islands are made up of mostly mountains and forest with some coconut groves around the fishing villages. Koh Mai See Yai has a splendid sandy beach along its bay on the east. A small island east of Koh Wai, Koh Mai Dang is peaceful and tranquil with white sandy beaches and unspoiled corals. A group of 24 islands south of Koh Chang was designated as Koh Kood district in 2007. These include the main island of Koh Kood, 9 islands of Koh Mak and 12 islands of Koh Rang. Koh Kood district has a very small population of less than 2,200. About 70% of the population is on Koh Kood while the rest live on Koh Mak. Almost all the other islands are uninhabited. Fishing and agriculture are the main occupations. Situated 82 km southeast Laem Ngob, Koh Kood is the farthest island from the mainland. It is also the easternmost island of Thailand bordering Cambodia. With an area of 105 sq km, Koh Kood is the second largest island of the Koh Chang Marine National Park and the fourth largest in Thailand, after Koh Samui. It is 25 km long and 12 km wide. It is supported by essential infrastructure, which includes a hospital, schools, police station, electricity (mainly for state-run facilities), water and telephone system. Fuel and solar energy are the main sources of electricity here. Most resorts generate their own electricity. The oldest village in Koh Kood is the Klong Mad Village where the people are of both Thai and Cambodian origins. These early dwellers had migrated from neighbouring Koh Kong since the turn of the 20th century during the French colonization of Indochina. Koh Kood has a mountainous terrain in the central region. About 70% of Koh Kood is covered by tropical rainforest. Development is scarce and mostly in coastal areas. Koh Kood boasts of scenic beauty, crystal clear water, pristine beaches, breathtaking waterfalls and a very pure natural environment. The resorts tend to cater to the higher priced market, offering tour packages which usually include boat transfers for added convenience. The west coast is lined with a series of pristine beaches, sparkling clear sea, captivating views and a great place to catch the magnificent sunset. Most of the best known beaches are along the bays. Noted fishing villages include Ban Klong Mad and Laem Hin Dan. Ban Klong Mad is the oldest village in the office, and the most significant ferry pier. The northern part of the said village is where the Klong Yaiki Waterfall is situated. It is a splendid tourist spot, where the stones of the waterfall are in different levels similar in formation to a very wide staircase. The famed Klong Chao Waterfall is situated further inland between Ao Klong Chao and Ao Tapow, on the southern part of Ban Klong Mad. This is a fabulous medium-sized waterfall with a large pool at its front, making it the most popular on the island. A 20-minute boat ride from the Klong Chao Bay plus a short hike leads to the fall. Alternatively, you can hike up the 4-km trail, which will take about 10 minutes. In 1911, Klong Chao Waterfall was once visited by King Mongkut (King Rama VI) and was given the royal name ï¿½Anamkok Waterfall’ in commemoration to Ong Chiang Lue, a Vietnamese king taking refugee in the Kingdom of Thailand during the reign of King Rama I in the late 18th century. Another tourist attraction on the island is the Ban Ao Salad. It is a fishing village that is more than 80 years old. It is comprised of 80 houses, inhabited by Thai and Cambodian people, most which hail from the Koh Kong province of Cambodia. In history, it was once a hiding place for Vietnamese and Chinese crooks, but in present time, is the seafood haven of the island. On the eastern part of Koh Kood is the Saphan Nam Luek pier. Sit around and wait for evening, and some people begin to gather for squid fishing right on the pier. Another interesting place to drop a visit on Koh Kood is the Khao Rearub. Its natural physical feature is similar to 3 boats laid side by side forming a small hill. Oddly enough, a small statue of a Thai naval officer is placed above the formation. In addition to that, a fascinating work of nature is the Tonsai Yak a tree more than a hundred years old, so big that it will take a number of people with handheld hands to go around its trunk. Two of the most beautiful islands closest to the shores of Koh Kood are Koh Mai Si Lek and Koh Raet. Both are small islands of coconut trees, fine beaches, healthy corals and excellent sunset viewpoints. Koh Raet, 400 meters west of Koh Kood, is a small island with a short sandy beach and covers an area of only 2.03 sq km. Lying between Koh Chang and Koh Kood, about 35 km from Laem Ngob, is a group of 9 islands called the Moo Koh Mak. The islands are Koh Mak, Koh Rayang Nai, Koh Rayang Nok, Koh Phi, Koh Kham, Koh Kradad, Koh Nook, Koh Nok, and Koh Nai. Only 4 of these islands, namely Koh Mak, Koh Kradad, Koh Kham and Koh Rayang Nok are occupied. Koh Mak, with an area of only 16 sq km and a 27-km coastline, is the third largest island of the Marine Park. It has a flat terrain with plenty of coconut and rubber plantations. A sub-district to Koh Kood, there are only about 400 people living here, most of them are related. The main attractions are the long beaches and clear seawaters, with a relaxing atmosphere, and ideal for diving and snorkeling activities. Accommodation mostly consists of charming bungalows. Koh Mak is shaped like a cross. The best beaches are on the southwest coast at Ao Khao, and the northwest coast at Ao Suan Yai, where the tiny Koh Kham lies in the distance. The main pier to Laem Ngob is the Ao Nid Pier, east of the island. Ao Suan Yai to the northwest has the longest and most beautiful beach where you can view Koh Raet, Koh Phee, Koh Kham as well as the captivating sunset. During low tide, a sand dune appears between Koh Mak and Koh Kham allowing you to walk across. The island does not have a hospital but it does have a clinic with a doctor that comes once a week. Infrastructure is limited and electricity runs 24 hours. There is a road system that conveniently link up the island. Visitors walk or rent bicycles or motorbikes to get around, as both sides of the road are lined with rubber trees thereby providing protection from the heat of the sun. Some of the resorts provide shuttle car service. There are now taxi services that run on the island and can pick you on several points. Koh Kradad, northeast of Koh Mak, is the first island to have land title deeds since the period of King Rama. Only 2-3 hours from Laem Ngob, you can walk around the island along its white sandy beach with attractive unspoiled coral reefs. Just 1 km. northwest of Koh Mak is Koh Kham, a small island with aged lava which proves the existence of a volcano in prehistoric times. During low tide, a sand dune enables walking to Koh Mak. Nearby Koh Mak, there are 2 smaller isles, the Koh Rayang Nai and Koh Rayang Nok. From Koh Maak, you can take a boat to Koh Rayang Nok which takes around 15 minutes only. It is a quiet island offering the utmost privacy. It features small white sandy beaches and beautiful crystal clear seawater. Also, the island’s sunset viewpoint is one of the best in the Marine Park. Meanwhile, Koh Rayang Nai is a privately owned island, and caters to activities such as snorkeling and diving only. It serves as a family heirloom handed down from one generation to the next. It is also a sacred interment ground for the ancestors of the island’s owners. During low tide, tourists can wade from Koh Mak to Koh Rayang Nai for snorkeling, fishing, and squid fishing around the 2 smaller isles. Some are fortunate enough to spot dolphins frolicking in these areas. To the west of Koh Mak is a group of 12 islands known as the Moo Koh Rang. Of these, Koh Rang Yai is the largest. It is covered with tropical virgin rainforests and boast of the longest and most beautiful beach in the area, the Had San Chao or San Chao Beach, where the sand is powdery white and water crystal clear. Divers can enjoy its scenic underwater beauty up to 25 meters deep. Koh Rang Yai has a hilly terrain, its only low-lying area are at the shores. Birds and reptiles are the main wildlife. Northwards from San Chao is Had Ao Cho or the Ao Cho Beach which is the site of a Marine National Park Ranger Unit. Here, the water is transparent and swimming is safe. Camping here is allowed at a small fee and with the approval of the officer in charge but you have to prepare your own food. Water supply and toilets are available. In front of the Ranger office is a bridge made by dropping rocks and stones into the sea. The bridge was built to help transport supplies from the International Red Cross Organization to the Vietnamese refugees in the past. Further south of Koh Rang Yai is Koh Rang Lek which is the main freshwater supplier to the former. There is a bird’s nest concession in Koh Rang Lek and it is also a major source of bat’s dung, which is known to be great fertilizers. Lucky visitors may see sea-turtles laying eggs on Koh Rang Lek and other nearby islets as they are found to be the chosen nesting grounds. The locals call them charamed eggs. The other well-known asset of Koh Rang Lek is its beautiful oval-shaped stones which has very smooth textures. The islands of Koh Kra, Koh Thong Lang and Koh Thian on the northeast of Koh Rang Yai are great sites for skin diving. An array of varied corals and fishes abound. Of these islands, Koh Kra has the longest beach, although only 20 meters long. Swimming is not recommended here as the seabed is carpeted with corals. All these 3 islands are only walking-distances apart and the seawater is so shallow that it is possible to do so during low tide, but you should float with a life jacket or buoy to avoid stepping on some of the healthy corals. The last coral island you should not forget is Koh Yak. A rock island just off the shores of San Chao Beach and perfect for snorkeling.